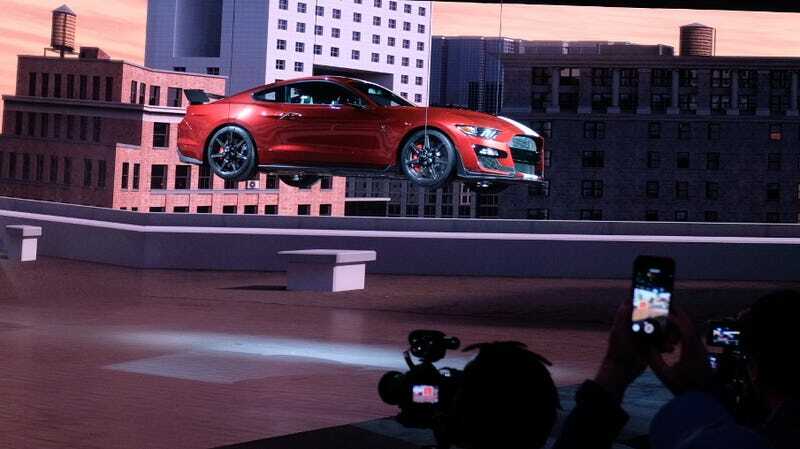 During the press reveal of the 2020 Ford Mustang Shelby GT500, the cinematic featured a staged virtual reality video game demonstration of the new GT500 blasting through a bunch of empty streets before being picked up by a helicopter. Then the real car lowered from the ceiling of the Cobo Center, and, well, it’s still up there. Just to be clear, it’s supposed to be there. Ford connected the lowering cables to the hubs on the GT500 so that it could be lowered to give the impression that the car flew out of the video game and onto the stage. Following the presentation, the car was raised back up and a different, blue GT500 with the track package was driven onto stage, which is the one you’ve seen photographed all over the place. The GT500 is still up there in a little box of curtains because Ford plans to run the little video game clip and lower the car back down onto the stage twice an hour, every hour for the remainder of the auto show. A little more wow factor to a car that already puts down over 700 horsepower from its 5.2-liter supercharged cross-plane crank V8 doesn’t really seem necessary to me, but it’s a decent stunt, and probably one of the more elaborate demos from an otherwise fairly quiet auto show. Like a god, it descends from the sky.